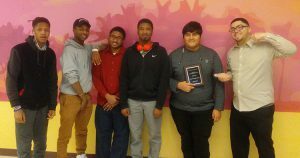 From Coach Ernest Chomicki: Bradley Tech’s Debate Team made history several times this past few weeks. Two weeks ago, at the Milwaukee Catholic National Qualifier, Michael Smith Jr., became the first Tech student to qualify for Nationals in Debate and the first to qualify for any kind of Nationals since Maceon Downer in 2012, who coincidentally is now the coach. Going into the State tournament this past weekend, Tech had the second largest MPS Debate team compete with five entries. And making history, Alberto Cruz made it to top 14 in the State in Lincoln Douglas Debate, with a 4-2 record. Jovan Hernandez took 17th in the State and was the top non advancing novice in the State. Khari Pleas-Carnie and Michael Smith Jr. followed with 3-3 records. Rounding out the team Kaidden Greer Moreno won his first round and never looked back. Congratulations to our Debate team for exemplifying what Tech excellence is all about.